The Reef Shark fishery. Sea Cucumber fishery and the Giant Clam fishery are some of the major fisheries that have gained economic significance in the Maldives during the past 15-20 years because of their high demand in the export market. During their peak years these fisheries contributed significantly to the export earnings of the country. Annual revenues exceeding MRf 1 million for the giant clam fishery, more than MRf 14 million for the shark fishery and more than MRf 3 5 million for the beche-de-mer fishery, were secured during their time. Unlike the above fisheries which were export-orientated, turtles and lobsters were exploited to cater to the local population and the tourist industry for food as well as production of jewellery. The development and evolution of each fishery exhibit classic trends and offer valuable information for future management options. The Reef Shark fishery which developed in the mid-'70s seems to have been maintained at moderate levels without major cause for concern as far as stock levels are concerned. However, exploitation in the tourist zone risks serious conflict with shark-watching divers. The Sea Cucumber fishery proved to be a typical boom and bust fishery. It commenced in the mid eighties with exports of beche-de-mer reaching a peak of 746 Mt. by 1990 and rapidly decreasing to less than 70 Mt. by 1994. 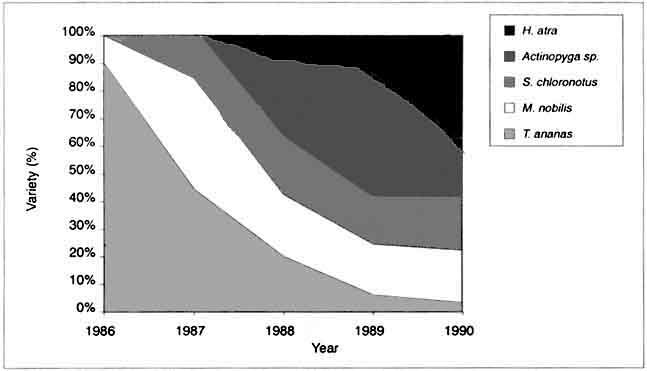 By 1991, the species composition of the catch had completely changed; the low valued species dominated catches and the high-valued species became harder to access. Results of management measures which have relevance for reef resources management are discussed largely on the basis of an analysis of the Sea Cucumber fishery. The giant clam fishery lasted only for two years during which period more than 20 Mt. of clam representing more than 125,000 clams had been exported. Fears of severe resource depletion as well as conflicts with tourism resulted in a ban on exports from 1991 and a subsequent ban on harvesting giant clams since July 1995. A proper study of the lobster fishery has not been carried out, although it has become a significant fishery. One common problem associated with all these fisheries was inadequate monitoring of the fishery. Catch and effort data were not collected regularly in any of the fisheries. While limited catch statistics is being recorded at present in some of the fisheries (e.g. shark and lobsters), these have their own limitations. Another important issue was that the development of some of these fisheries resulted in conflicts with the tourism industry. Limited management measures are in place for most of the fisheries. However, monitoring and implementation of these measures have proven to be difficult. Exploitation of reef-associated resources for commercial purposes is of recent origin in the Maldives. Traditionally, Maldivians have depended on tuna and tuna-like species from the coastal waters for home consumption as well as export, reef associated resources not being popular among the local population as a source of food. However, the reefs and reef resources have gained significance in the past 20 years or so both as a tourist attraction and as an export product. "Motorised transport and the demand for exotic seafood by the tourist industry as well as the international markets, have had serious effects on coastal reef-associated resources" (Manik 1994). In addition the traditional tuna fishermen of the Maldives are extremely adept at turning their hands to any other fishery (either part-time or full-time) that has the potential to increase their income, thus affecting the rate at which non-traditional reef resources are tapped. The revenue from reef product exports have increased from MRf 3.8 million in 1981 to MRf 36.71 million in 1994. Meanwhile the products exported diversified from mainly dried reef fish and shark products to include chilled frozen and live reef fish as well as invertebrates such as sea cucumber and giant clam. Giant clams, sea cucumber and reef sharks are some of the major reef-associated resources exploited because of their high demand in the international market and lobsters are fished to cater to the tourist industry locally. In addition to managing each fishery for long-term Sustainability resource managers face the task of resolving conflicts between conflicting user groups. Comprehensive studies on most of the major fisheries of the Maldives have been carried out whenever a fishery gained commercial importance. While these reports include detailed descriptions of all aspects of each fishery, a short review of the different fisheries, highlighting important management issues may be more helpful from an integrated resource management perspective. Such a review would be useful in identifying similar trends in the different fisheries while presenting the unique characteristics of each fishery. This review aims to highlight the important issues associated with each fishery which would aid resource managers to identify issues to be addressed in an integrated reef resources management plan for the Maldives. The fishery for sea cucumber is a non-traditional fishery in the Maldives. It is one of the examples of a scarcely exploited resource being rapidly used up once its income earning capacity was realised, in this case solely as an export product. The first reported export of beche-de-mer from the Maldives was in late 1985 when a trial shipment of prickly red fish (Thelonata ananas) was made to Singapore. The fishery went largely unmonitored in the initial years except for export statistics which was compiled by customs. A short study of the fishery was conducted in 1991 with the aid of BOBP, to review all the relevant issues associated with the fishery including the need for management of the resource and further development of the fishery. This review is based on the above sources of information, the most comprehensive of which is the study carried out by L. Joseph in 1991 for BOBP. The information sources used by Joseph (1992) were mainly interviews with fishermen and export agencies, data from customs and export agencies and some first hand observations of the fishery. It is assumed that the customs export data reflects the catch since sea cucumber products are rarely utilised within the Maldives. In addition, questionnaires were sent to all the inhabited islands in 1992, to be filled by the island development committee in order to obtain their views towards various management options available. The processed product of sea cucumber, beche-de-mer, was first exported from the Maldives in 1985 as result of interest shown by a party in Singapore through a Maldivian residing in Singapore. By 1986 there were two exporters in the trade and the fishery had spread to most of the atolls both in the north and south of the country. The beche-de-mer exports increased rapidly since 1985, reaching a peak of 745 t by 1990, just five years since its inception. By 1994, it had declined to 66t (Fig 2.1. ), just as rapidly as it had grown by 1990. The total value of exports peaked in 1988, earning more than MRf 39 million in that year. Figure 2.1. Beche-de-mer exports from the Maldives 1985 -1994. The average price per kg of beche-de-mer exported was the highest in the first three years of the fishery, ranging from MRf71/kg to MRf91/kg, when the beche-de-mer exports were dominated by high-value varieties. It subsequently decreased to MRf 38/kg in 1989 and again increased reaching MRf 90/kg in 1993 (Table 2.1.). The low average price/kg from 1989 to 1991 is attributed to the increase in the amount of low valued varieties in the exports. The average prices per kg in 1993 and 1994 are similar to those of the first few years when high-value varieties dominated exports. Unlike the average price/kg of exported beche-de-mer, the price/kg paid to the fishermen for various species individually increased steadily over the years (Fig 2.2.). The price paid to fishermen for the M. nobilis increased from just MRf23/kg in 1987 to MRf78/kg in 1991. Similarly the price paid for T. ananas increased from MRf42/kg to MRf 100/kg in the same time period. Figure 2.2. The price/kg paid to fishermen for different varieties of sea cucumber. As the fishery evolved, the species composition of the exports also changed (Fig 2.3.) Initially only the high value species like Thelenota ananas (prickly red fish) and Microthele nobilis (white teat fish) were exported. However five years later, by 1990, catch composition had completely changed, with exports being dominated by the low-valued Halodeima atra (lolly fish). It is suggested that the level of exploitation of this species clearly reflects the state of the sea cucumber fisheries in the various islands. It is believed that fishermen tend to leave this species without exploitation as long as other species are available (Joseph, 1992). Figure 2.3. Species composition of beche-de-mer exported from the Maldives. During the initial stage of the fishery, sea cucumbers were harvested by hand picking during low tide from the intertidal region and from shallow water lagoons less than one meter deep. When increased exploitation resulted in depletion of resources in these easily accessible areas fishermen adopted other methods and areas of collection. Snorkeling, spears and use of line with hook and sinker helped exploit the resources in the deeper waters up to 15-20 meters. A few people who had access to SCUBA gear utilised these to selectively harvest the high-valued species like T. ananas and M. nobilis from depths up to 30 meters. One such group had 17 divers diving for sea cucumber 15-20 days a month for 9 months of the year (Joseph, 1992) during the peak years of the fishery. It is believed that the production of the high-valued M. nobilis was maintained after the first few years of the fishery due to the development and expansion of SCUBA diving. Further, it was suggested that in spite of this practice the production of T. ananas could not be maintained due to overexploitaion of the resource (Joseph and Shakeel, 1991). At present SCUBA diving for sea cucumber is prohibited by law in the Maldives. When the sea cucumber fishery was at its peak it was a most popular fishery among fisherfolk, second to the major tuna fishery of the country. It replaced the other reef fisheries and became the major reef fishery during the non-tuna season. Joseph (1992) found that among 16 islands surveyed, 5-6% of a total of 2500 fishermen were involved in sea cucumber fishery full time and the remaining were involved part-time to varying degrees in the fishery. Most fishermen went on day trips for sea cucumber. However, some would be away from their home islands from 1-4 weeks for sea cucumber. During these long trips the catch was processed largely in the uninhabited islands (Joseph and Shakeel, 1991). During the initial years of the sea cucumber fishery, income from this fishery exceeded that from the tuna fishery in some islands. The monthly income of a fisherman varied from MRf500 to MRt3000 in 1991, depending on the fishing effort and the availability of the resource (Joseph and Shakeel, 1991). The importance of the fishery to the fishermen during its best years was well summarised by a fisherman: "We have been able to build or renovate our houses, construct attached toilets and water tanks, purchase household items and even reclaim land from the sea with the income from Huifilada" (Joseph and Shakeel, 1991). However, at present very few fishermen are involved in this fishery. During the peak years of the sea cucumber exploitation there were at least six exporters of beche-de-mer operating in the country. However, at present there are only two major exporters. Very little biological information is available about the holothurian resources of the Maldives. No stock assessment studies have been carried out to date. However an idea about the relative abundance of the different commercially important species was provided by Joseph (1992). Following is an account of the biology of commercially important species prepared by Joseph (1992). This species was reported to be the most valuable species in the beche-de-mer market. It is known to occur in two colour morphs of which the white teat fish is, more valuable and is reported to occur in waters from 3-30 meters in coral sand in reef passages and in sea grass beds. The black form is found on clean sandy bottom in shallow waters of 3 meters depth. This species was being harvested from deeper waters and outer surf areas and was believed to be very rare in some of the islands by 1991. At the beginning of the fishery, between 400 and 500 numbers of this species were collected per day by a single boat. However, by 1991 the daily collection could be as low as 5 to 6 per boat. It was believed that collection by SCUBA divers targeting white teat fish exclusively was responsible for maintaining the level of production after the first 2-3 years. The average length of the processed M. Nobilis fell within 14-16 cms. This species which is found to grow up to 700 mm in length is reported to be found at depths of 2-3 Om in clean sandy bottoms of the reef enclosed lagoons and beside coral heads. It is believed to be very rare in most of the islands as a result of resource depletion due to selective harvesting. Small amounts were reported to be available only in deep waters of 20-25 meters. At the beginning of the fishery some fishermen collected as many as 700 per boat per day but were harvesting only 10-15 per boat per day by 1991. The average length of the processed product fell within 16-18cms. Reported to occur in shallow waters of the lagoons and reef flats with broken rubble in depths up to 2 meters and grows to 400 mm. Large specimens have been taken from depths of 9-10 meters. Although quite abundant in many islands, thought to be of little value commercially. The processed average length fell within 10-11 cms. Reported to be the most abundant species in the Maldives, the lolly fish is also one of the largest, and can grow up to 600 mm. The smaller individuals were observed in large numbers in shallow waters, in ankle deep water in sandy reef flats. Inside the reef they are reported to be found at depths up to 6 m and reach a length of 300 mm. Larger animals of 600 mm were observed in deeper waters outside the reef. The processed average length fell within 6-7 cms. This species is commonly found where the surf breaks on the outside of the reef, firmly attached to the substrata. Fishermen who were aware of their habitat claimed that it is easily taken as it is very conspicuous. Grows to about 300mm live length and the processed average length is between 11 to 13 mm. The rest of the Actinopyga species exported were grouped together. The species in this group include: A. miliaris, which is said to occur in shallow waters of more than 2 meters in clear water on reef flats and on algal beds; A. lecanora which is reported to be found at 2-10m depths, often on underside of stones and on coral sand with sea weeds and grows up to 400 mm length; A echinites which is reported to grow to 300mm and generally found in deeper waters up to 30 meters, on sandy bottoms and among live corals. The other exported sea cucumber species, M. axiologa (Elephants trunk fish), T. anax (Turtle shell), and Bohadschia marmorata (Amber fish) were not harvested in large amounts. Based on information provided by fishermen, Joseph (1992) ascertained the relative abundance of the commercially important species in some islands on a scale of: "very common", "common", "rare" and "very rare" (Table 2.2.). The most abundant species were identified as H. atra, S. chloronotus, and Actinopyga spp. The species reported to be the least abundant were T. ananas, M. nobilis and A mauritiana. It is not clarified whether this was the relative abundance at that point in time when the resources had been exploited considerably or in general at the beginning of the fishery. Interactions with the tuna fishery. Tuna is the main fishery of the country. Resources (craft and manpower) were diverted from this fishery to the sea cucumber fishery during the peak years from 1988-1991. In some islands the income from sea cucumber fishery was greater at certain times than from the tuna fishery and fishermen preferred to go for sea cucumber even during the tuna season. However, some fishermen preferred remaining with tuna fishing since they believed the sea cucumber fishery involved more work (Joseph, 1992). No conflicts with other activities or resource users have been reported. Uncontrolled Expansion of the Fishery. Uncontrolled expansion of the fishery resulted in rapid depletion of0 resources, especially the high-valued less abundant species like T. ananas and M. nobilis. Too little regulatory measures were taken too late. By the time a regulatory measure was taken in 1993, more drastic measures were called for. In addition, the regulatory measure declared (i.e. prohibiting collection using SCUBA) is not implemented properly. Uneconomic utilization of the resource. Bad processing procedures resulted in poor product quality, especially in the beginning of the fishery, which resulted in loss of export revenue to the country. Proper techniques for processing sea cucumber had not been demonstrated to the Maldivian fishermen at the beginning. It was believed that that revenue from exports could have been increased by about 30% if the beche-de-mer quality had been better (Joseph, 1992). The view of the island development committees on different management options available were sought in 1992 through a set of questionnaires. However, the response to the questionnaires was not analysed until recently. The two options that received the most support were for banning collection of sea cucumber using SCUBA (76%=yes) and setting a size limit for H. atra that is allowed for collection (79%=yes). Collection of sea cucumber using SCUBA was banned in 1993 although not necessarily in response to the results of the above mentioned questionnaires. The most unpopular options proved to be declaration of closed and open areas both in the North and South of the country and having them opened and closed alternatively. Half the respondents chose this as the option they did not want implemented. The second most unpopular option was to determine and establish collection zones. Establishment of these zones considered the size of the zone, the abundance of sea cucumber in the area and the size of the population of the area. Collection of sea cucumber within the zoned area was to be restricted to islanders residing in that area. It is also of interest to note that although the option for allowing only people belonging to each administrative atoll to collect sea cucumber from that atoll was presented, it was not particularly popular. This would probably have relevance when considering management options for all reef fisheries. Appendix-1 provides the details of various options presented in the questionnaires and the responses. A separate background paper (Shakeel and Ahmed, 1996) is available with details of the management options provided and the analysis of the response from the various islands. a) A moratorium on the catching and export of T. ananas for 4-5 years to be declared, in order to rehabilitate resources depleted by heavy fishing pressure. b) A complete ban on the collection of all sea cucumber species using SCUBA in order to protect the spawning populations of high-valued T: ananas and M. nobilis in the deeper waters. Action Taken - Banned since 1993. However it is not monitored and implemented properly, thus not effective. c) A minimum size limit (e.g. above 6" processed length) be placed for H. atra, so that maximum economic benefits can be derived from the resource. d) Fishermen in different atolls be allowed exclusive use of resources within their own atolls, which would also lead to a more regulated fishery with better monitoring. e) Training and demonstration of proper processing techniques be given to fishermen so that economic benefits are maximized. f) Data collection and monitoring system be set up to obtain catch (export) and effort data pertaining to the fishery. It was suggested that the government officials responsible for fisheries matters in the islands gather data on the number of fishermen and craft involved in the fishery on a periodic basis and at the same time have exporters keep records of quantities and varieties of beche-de-mer obtained from the different islands. g) Establishment of sea ranching programs with the active participation of fishermen. Action taken - Some work being done by a private enterprise in collaboration with the Marine Research Section. The Maldivian shark fishery which was traditionally based on the demand for shark liver oil has developed and diversified tremendously in the past 15-20 years. Currently three main shark fisheries exist in the Maldives. An offshore longline and handline fishery for oceanic shark, which yields fins and meat for export. An inshore gillnet, handline and longline fishery for reef and other atoll-associated shark, which also yields fins and meat for export. And an offshore longline and handline fishery for Gulper Shark which yields high value oil for export. Of these this review is concerned with the fishery for reef and other atoll-associated shark. The fishery targeting reef sharks seems to have expanded in the mid 1970's and maintained since then. The reef shark resource of the Maldives is very valuable, bringing in revenue both through fisheries and tourism. Shark-watching is a major attraction among tourist divers and shark products bring in export earnings. Problems arise due to conflicting methods of resource utilization by the two sectors. Reduced shark numbers in popular shark-watching sites due to fishing, lead to complaints from the tourism sector. Thus resolving the conflicts between resource users as well as managing the fishery for long-term sustainability are management issues faced by the concerned authorities. The objective of this review is to provide an overview of the fishery for reef and other atoll-associated sharks in the Maldives, highlighting the various management issues associated with the fishery. This review paper is mainly a summary of the study carried out by Anderson and Ahmed (1993) "The Shark Fisheries in The Maldives". Most of the information about the fishery is therefore from the time of the above study which was in 1992. It is assumed that the general characteristics of the fishery are still the same although some estimates (e.g. number of boats involved in the fishery, catch rates) may have changed. In addition some information has been updated using customs data and estimation methods used by Anderson and Ahmed (1993). Likewise managerial measures taken subsequent to the study by Anderson and Ahmed (1993) are included in order to update this review. The Maldivian shark fisheries was traditionally based on the demand for shark liver oil used for regular maintenance of wooden boats. Traditionally two main species were targeted by two related forms of shark fishing. These were; maa keyolhu kan which targeted Tiger shark (Galeocerdo cuvier) and madu miyaru keyolhu kan which targeted the deepwater Six-gill Shark (Hexanchus griseus): This age-old pattern of fishing started to change in the early 1960s with the introduction of longlining into the country. During this time pelagic shark longlining started to spread in the country replacing maa keyolhukan in the process. The next big change came in the mid-1970s with the widespread motorization of fishing craft, the introduction of gillnetting and an increase in prices paid for shark fins. This lead to a boom in shark catches which has been maintained since then. The reef and atoll-associated shark fishery is mainly based on the export of dried fins most often to Singapore. The meat is dried and exported as a valuable byproduct to Sri Lanka. The jaws of valuable species are dried and sold to tourist shops. Very rarely is the skin dried and exported. It is difficult to follow the progress of the reef and atoll-associated shark fishery as an independent fishery. There are no separate catch statistics available for the different species or categories. The data sources available to estimate the shark catches are the Customs export data for dried fins. However the dried fins exported include both those of reef and other atoll- associated shark as well as oceanic sharks lumped together. Thus any catch statistics provided is an estimate that includes oceanic sharks as well. Figure (3.1.) 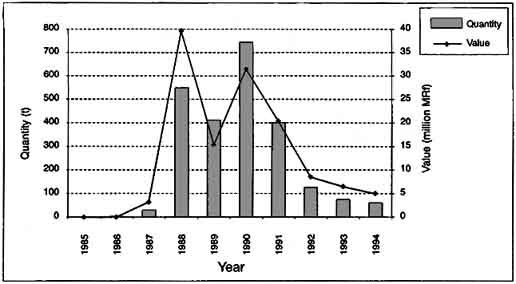 gives the shark fin exports from 1963 to 1994 and the total catch estimated (Anderson and Ahmed, 1993) using this data. Figure 3.1. Dried shark fin exports and estimated shark catch from 1963-1994. Source: Modified from Anderson and Ahmed 1993. - Motorization of local fishing boats. - Increase in price paid for shark fins. The average annual shark catch since 1977 has been about 1388 t/year. There has been considerable variation about this average value but without any obvious trend. The value of shark meat is an estimate since Customs data combine dried shark meat with the rest of dried reef fish and thus do not provide a direct measure of the value of shark meat exports. The method of estimation is from Anderson and Ahmed (1993). Figure 3.3. Export price of salt dried shark meat and dried fins from 1984 to 1994. The estimated average annual export price of salt dried shark meat (Anderson and Ahmed 1993) has slowly but steadily increased over the years from about MRf4.00 in 1988 to about MRf 13.00 in 1994. In contrast the export price of dried shark fins increased rapidly over the years from about MRf95.00/kg in 1984 to a high of more than MRf400/kg by 1994 thus maintaining the high demand for the product. Reef sharks and other atoll-associated sharks are fished throughout the Maldives by gillnet, handline and longline. Bottom-set gillnets are most commonly used to fish reef sharks in the Maldives. They are locally made, in panels of about 2.5-3.0m depth and 45-60m length with meshes of about 23-25 cms. Full-time shark gillnetters use nets made up of 7-9 such panels. Fishing trips of 14-18 days are made during the Full Moon period. During these trips generally two nets are set every evening and hauled in the morning. The nets are set perpendicular to the reef, down the slope, on the outer reefs of the atoll and on the atoll floor, between or adjacent to reefs, within the atolls. The major species caught include the Blacktip Reef (Carcharhinus melanopterus), Grey Reef (C. amblyrhynchos), Silvertip (C. albimarginatus), Spottail (C. sorrah), Whitetip Reef (Triaenodon obesus), Nurse Shark (Nebrius ferruginous) and the Smalltooth Sandtiger Shark (Odontaspis ferox). Of these the Blacktip Reef Shark is more commonly caught from shallow lagoons and the Smalltooth Sandtiger Shark is taken outside the atoll at greater depths. Catch rates vary from 3 to 8 sharks per night and most fishermen involved in the fishery agree that the catch rate has gone down in the past decade, especially in the most heavily fished areas. Bottom-set longlines are also used to target reef- and atoll-associated sharks. Generally each longline carries 30-40 hooks. The catch composition of bottom-set longlines deployed within the atolls are said to be similar to that of the bottom-set gillnets. Simple one-hook handlines which are commonly used for reef fishing sometimes take sharks, especially juveniles. Occasionally reef sharks are specifically targeted using stronger lines with wire leaders (Anderson and Ahmed, 1993). Estimates of number of vessels engaged in shark fishing were made by Anderson and Ahmed (1993). In general shark grow slowly, mature late, have small numbers of young and live long. As a result, there is a direct relationship between stock size and recruitment, with population replacement rates being very low. All these factors mean that shark stocks are very easy to overfish. These factors also mean that shark stocks, once overfished, may take years, even decades, to recover. A proper stock assessment has not been carried out for shark stocks of the Maldives. However, on the basis of export data, knowledge of shark biology, interviews with fishermen and interviews with experienced divers, Anderson and Ahmed (1993) suggested that the reef sharks were being fished at a moderate level of fishing effort, and were probably sustainable if fishing effort was not increased from the level of 1992. Inadequate monitoring of the fishery. Vital information like catch and effort data necessary for basic management decisions are not collected. Although a 'shark' category has been included in the fisheries statistics since 1992 this does not differentiate between the different shark fisheries - namely, the reef and other atoll-associated shark fishery, the oceanic shark fishery and the deepwater gulper shark fishery. Conflict between tuna fishermen and shark gillnetters. Pole and line tuna fishing using live bait is the most important fishery in the Maldives. Most tuna fishermen believe that shark-netting 'disturbs'1 the bait fish in the area resulting in reduced catches. Furthermore tuna fishermen are hostile towards gillnetters coming from other areas fishing on 'their' reefs. Shark gillnetters often move from one atoll to another for fishing. Due to this conflict gillnet buoys are often stolen and the nets tampered with. Conflict with tourism industry. At present tourism is undoubtedly the most important economic sector in the Maldives at present. Shark watching is a major attraction for tourists that come to dive in the Maldives. At several sites, groups of four to ten or more Grey Reef Shark can be regularly seen in complete safety. Other species that are regularly seen in certain sites include the Whitetip Reef Shark and the Scalloped Hammerhead. An estimated US $ 2.3 million is spent per year by divers directly on dives at shark watching sites. Further it is estimated that a single Grey Reef Shark at a popular dive site may be worth a hundred times more alive than caught by a fisherman. The same shark is worth about US $ 30 to a fisherman when processed and sold (Anderson and Ahmed, 1993). Thus the vigorous protests made by dive operators on occasions when they have seen shark fishermen operating on popular dive sites is understandable. In 1995 fifteen sites were declared as protected areas but open for diving, several of these are popular shark watching sites. It is hoped that this would help, bring an end to shark fishing in these popular dive sites. - grow to maturity and reproduce. The recommendations pertaining to the reef shark fishery made by Anderson and Ahmed (1993) after studying the shark fisheries of the Maldives are given below. Subsequent and related management measures taken are also provided. 1) The country's most outstanding shark watching site (Fish Head) to be considered for protection. At the same time it was suggested that such protection may not be entirely effective by itself since shark can and do move considerable distances. Action taken - Protected from June 1995. 2) Other popular dive sites to be listed for possible protection. Action taken - 15 sites protected from June 1995. 3) The use of gillnets within the tourism zone to be reviewed. Ministry of Fisheries and Agriculture to give careful consideration to the future of shark netting particularly within the main tourism zone. In view of the fact that two major shark-netting islands are in this zone, banning of shark-netting in this zone by fishermen from other atolls to be considered as a first step. 4) Ban landing of sharks by night fishing resort groups. 5) Detailed information (catch, effort, species, size etc.) on shark fisheries to be collected. Action taken - Since the end of 1992 a shark category has been included in the fisheries statistics. However this does not differentiate between the different shark fisheries existing in the Maldives and as such cannot be used as an indication of the condition of a specific fishery. If the data is to be of any use it should at least be compiled by gear category, namely gillnet, drift longline, bottom-set longline and multihook handline. 6) Marine Research Section staff to be trained in fields related to fishery stock assessment and management. Action taken - limited training. 7) A fisheries biologist to be assigned full-time for shark resource monitoring and management, as trained manpower becomes available. 8) Extension material to be prepared to inform fishermen of the dangers of overfishing in general and of the problems of shark fisheries in particular. The potential of offshore shark longlining and correct shark processing techniques to be disseminated. There are two indigenous species of giant clam in the Maldives, Tridacna squamosa and Tridacna maxima. The local term Gaahaka is used for both the species. T. maxima is a small species reaching a maximum size of about 35 cms in length. The giant clam fishery in the Maldives was entirely based on T. squamosa as this is the larger species, growing to an average size of about 45 cms. Maldivian fishermen mistakenly believed that T maxima were juvenile T. squamosa and thus would grow to replace the larger T. squamosa harvested. Table 4.1. Exports of frozen clam meat (1990-1991). Source: Maldives Fisheries Statistics, 1990-1994; Anderson R C - Unpublished Report. T. squamosa were selectively harvested as the Taiwanese buyers would not accept adductor muscles weighing less than 100 g when frozen. The fishermen skin-dived to collect the giant clam from the reefs. The major centre of this fishery was R atoll Ugoofaru. At the start of this fishery, the fishermen from this island collected clams from the lagoons of the local islands. Later they moved on to the shallow areas as they realised that the large clam also occurred in this area. However, they again had to move back to the deeper waters as the number of clams diminished in the easily accessible areas. When one reef was wiped off the fishermen moved on to the next. As they moved on further and further from the base island, fewer clams were collected in a day because they had less time for fishing. The Marine Research Section of the Ministry of Fisheries and Agriculture conducted a stock assessment survey of giant clams and their potential for culture in 1991 (Barker, 1991). The stock assessment survey compared fished and unfished areas for abundance of clam. As giant clams were not traditionally harvested in the Maldives the unfished reefs was assumed to represent virgin stocks. On a survey of six heavily fished reefs very few T. Squamosa were observed. T. squamosa were seen during only five of the 15 tows (33 percent). The mean number of T. squamosa for all fished areas surveyed was 3.4 clams/ha. On the other hand T. squamosa was seen during 14 of the 15 tows (93 per cent) on unfished areas where 44,050 m of reef were sampled. In areas where T. squamosa was found, densities ranged from 2.8 clams/ha to 65.6 clams/ha. The mean for all the unfished reefs in the area assessed was 10.6 clams/ha. T. maxima was adequately abundant in all areas surveyed. The average density being 29.9 and 39.6 clams/ha on fished and unfished reefs respectively. Exploitation rate: T. squamosa was fished at a very high rate in certain atolls of the Maldives during 1990 and 1991. There were genuine fears that if a management measure was not taken promptly the exploitation of giant clams would have brought the clam stocks below a critical population density, whereby natural recruitment would be threatened. Conflict with the tourism industry: The tourism industry is one of the major industries in the Maldives. The income generated from the clam fishery was insignificant when compared to the tourism industry. The damage caused to the reef when harvesting giant clams and the removal of too many clams brought these activities in conflict with the tourism industry. Accession to Convention of International Trade in Endangered Species (CITES): Tridacnids have been listed in Appendix II of CITES among globally threatened species. Although Maldives is not a member country the authorities knowing the importance of protecting this species decided to stop all trade in giant clams. Therefore the culture of giant clam is important if Maldives is to export giant clams in the future. The giant clam fishery was very unsustainable in nature. Ministry of Fisheries and Agriculture decided to ban the fishery through the Ministry of Trade and Industries. In July 1991, Ministry of Trade and Industries stopped issuing new licenses for the export of clam products, the existing export licenses were not renewed once they expired. Collection of giant clam was declared illegal from June 1995 onwards. Barker (1991) discussed the possibility of establishing a hatchery facility for giant clams in the Maldives. Marine Research Section of the Ministry of Fisheries and Agriculture has now started to do experiments on giant clam culture. The aim of these experiments is to work out giant clam culture techniques suitable to the local condition of the Maldives, based on the already existing techniques in other parts of the world. Lobster are collected mainly at night by the lobster fishermen by swimming with lights, diving along the reef face and also walking on the reef flat. 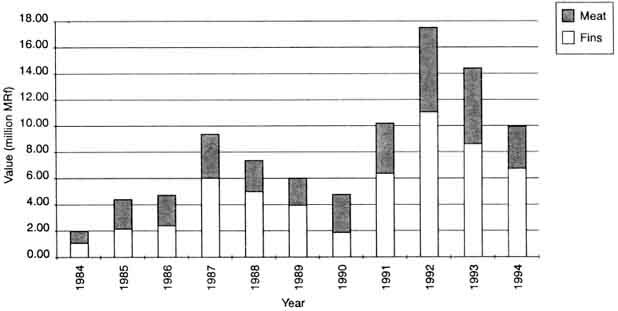 The data collected by Ministry of Fisheries and Agriculture shows a steady increase in the number of lobster harvested with the exception of 1990 and 1993 in which years the number decreased considerably (Fig. 5.1.). The recorded number of lobsters harvested reached 3 8,110 in 1994. The value of lobsters has increased rapidly with the unit price increasing from 27.5 MRf/lobster to 58.8 MRf/lobster over a seven year period At present lobster prices are reported to be in the range ofMRf80 to MRf 150 per lobster. - Ministry of Fisheries and Agriculture has been collecting lobster catch data since 1988. - The Maldivian government declared a size limit on collecting lobsters with carapace length less than 25cm, and a ban on exploiting berried lobsters in 1978. - A proper study has not been carried out on the lobster fishery. Therefore not enough information is available on this fishery. - The lobster reports filled in by the Atoll offices for fisheries statistics purposes inquire about the number of lobsters caught in three categories, namely: shallow water lobsters, deep water lobsters and others. These categories are not recorded separately and there is considerable doubt whether the officers know these details. At the same time the validity of the earnings reported on the same form is doubtful as they do not agree with the reported number of lobsters caught. (Parry & Rasheed 1995). 1) Establish sanctuaries for the breeding population that can provide new recruits to the lobster population in the reefs open to lobster fishing. 2) Establish a set season for lobster fishing. However, it was suggested that this may conflict with tourism. 3) Expand the already existing system of reporting lobster harvests to include species composition and diver effort from the atolls. 4) Improve the field component to carry out resource surveys of fished and unfished reefs to determine the stock status. 5) Recommend fishery management options based on resource surveys..
6) Provide training for MOFA employees to collect, analyse and record information to assist fishery planning and resource management. 7) Ban collection of lobsters using SCUBA. 8) Accomplish a buyer collection information system to include the island or atoll of the lobster, quantity, prices paid, etc. The most common turtles that are exploited are the green turtle and the hawksbill turtle. They are caught for their meat and eggs which are rich in protein. The hawksbill turtle is specially exploited for the shell which is used to make expensive jewellery for the tourist trade. About fifty years ago thousands of turtles nested every night on the beaches of the Maldive Islands. But now the number has decreased to a few every month. Taking of all species of turtles was banned by MOFA for ten years from 25th June 1995. It is illegal to import turtle and turtle products from 1st August 1995. And the export of turtle and turtle products and the sale within the country was banned from 1st January 1996. Anderson R.C. and H. Ahmed (1993) The shark fisheries in the Maldives. Ministry of Fisheries and Agriculture, Malé and FAO Rome. 73 pp. Anderson R. C. and M. S. Adam (unpublished report) Executive review of the status of Maldivian fishery resources 1994-1995. Ministry of Fisheries and Agriculture, Malé, Rep of Maldives. 28pp. Barker J. R. (1991) Giant clams in the Maldives - A stock assessment and study of their potential for culture. BOBP/WP/72: 37pp. Barker J. R. and H. Shakeel (1991) Giant clam Fishing: Concern in the Maldives. Bay of Bengal News. 42: 16-18. Joseph L. and H. Shakeel (1991) The beche-de-mer fishery in the Maldives; only a few years old but already in need of management. Bay of Bengal News. 43: 2-5. Joseph L. (1992) Review of the beche-de-mer (sea cucumber) fishery in the Maldives. BOBP/WP/79:31pp. Maniku M. H. (1994) The status of coral reef resource systems and current research needs in the Maldives, 25-27. In: J.L. Munro and P.E. Munro (eds.) The management of coral reef resource systems. ICLARM conf. Proc. 44, 124 pp. Parry G. and H. Rasheed (1995) Fisheries statistics systems. Fisheries economics and statistics program. EPCS Economic paper No. 4. Ministry of Fisheries and Agriculture, Malé, Rep of Maldives. 27 pp. Ahmed H. and Shakeel H. (1996) Public view of management options for the Sea cucumber fishery. Unpublished report. Marine Research Section, Ministry of Fisheries and Agriculture, Maldives. Wright A. (1992) The Maldives fishery resources: assessment and requirements for development and management. 95 pp. In: Maldives fishery sector strategy study, Final Report Vol. 2. Primex-GOPA-TPC. Percentage of yes and no answers for different options on sea cucumber management questionaires (N=196). Do you believe that banning collection of sea cucumber using SCUBA is good? Do you think that banning collection of sea cucumber using SCUBA gear only in the tourism zone (A, K, V - atolls) and allowing collection in the other areas is agreeable? Do you agree with banning fishing for sea cucumber using spears? Do you agree with banning fishing for sea cucumber using hook and sinker? Do you believe that closing the sea cucumber fishery for a period and then opening is good? If you agree with q. 6 how long a period would you recommend? Do you agree with having a closed and open area in the Northern Atolls as well as the Southern Atolls and having them opened and closed alternatively? If you agree with q. 7 how do you suggest that the areas be divided? Do you agree with having a special zone for collecting sea cucumber, where people from that zone only can fish there and people from islands outside that zone have to obtain a permission from the islands belonging to that zone if they wanted to fish there? If you agree to a zonation system which option of the two below do you prefer? - Zone according to the administrative system which already exists. - Zone after taking into consideration the size of the area, the abundance of sea cucumber in the area, and the population of the area. Do you agree with banning collection and sale of T. ananas and M. nobilis for a period? If yes to q. 14 how long a period would you suggest? Do you agree to having a size limit for H. atra which is legal for collection and sale? If yes which size would you suggest? Set a size limit for H. atra (Holhi lada) which is legal for collection and sale. Ban collection of sea cucumber using SCUBA only in the tourism zone (A, K, V atolls) and allow it in all the other atolls. Allow only people belonging to each administrative atoll to collect sea cucumber from that atoll. Ban collection of T. ananas (prickly red fish, alanaasi, molhu) and M. nobilis for a period. Determine a zone for collecting after taking into consideration the size of the area, the abundance of sea cucumber in the area, and the size of the population of the area and then allow people from the islands belonging to the zone only to collect sea cucumber from that zone.